Not just for large groups, Magnus Ridge has a top notch tasting bar, perfect for anyone. 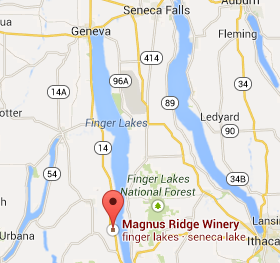 Welcome to Magnus Ridge Winery! When you walk into Magnus Ridge Winery you are walking into old world France. With the exposed post and beams, large tasting bar and our custom wine glass chandelier you will instantly feel relaxed. Browse the large selection of wine related gifts as you wonder throughout the facility. Be sure to check out our custom glassware produced by Cazenovia College out of our recycled tasting bottles. Come sample our wines in our two large testing rooms, or pull up a spot at the bar! Our smaller private tasting room. Mouth watering chocolates available at Waterlillies Cafe!